I was wearing the wrong shoes. My new navy brogues were rubbing already and I’d only walked to the bloody car. But today, they were the least of my worries. I gave Gemma a tight-lipped smile. I was scared I’d contradict her if I opened my mouth. Outside, the May morning was in full swing, sunshine dripping off the car even though it was only 9:30am. It reminded me of those endless summer days we used to share at university. The end of term, exams done and worries shed. Us slathering layers of coconut oil on our skin and basting ourselves before we knew any better. Even the grass outside reminded me of our university grounds, cut to regulation length, neat and ordered. Everything as it should be. The complete opposite of this morning, in fact. Because today, we were burying James. The first of the gang to die. I put my hands to my face. If Maddie turned up with a beautiful wife, I was going to dissolve on the spot. Gemma patted my knee as I dropped my hands. “Only about 47 times on the way over here.” My best friend gave me a look, before running a hand through her short, dark hair. She’d had it cut this week and she was still getting used to it. Everyone at work kept telling her she looked like Halle Berry in that James Bond film. Gemma said they needed to update their references, but I’d told her to concentrate on the ‘you look like a Bond girl’ part. I creased my face, before turning to Gemma. Not only my best friend, but also my business partner for the past five years. “I appreciate your concern, but I can cope. I’m an adult now, fully grown, responsible even. And Maddie and I were a decade ago. Today, I’ll be civil, we’ll smile, and then I never have to see her again. I knew this might happen one day, and James has brought that day forward. Bloody James, going and dying on us.” I smiled, even though every time I said it, my heart broke a little bit more. I’d loved James like a brother. Plus, he was far less annoying than my actual brother. A wave of sadness washed down me, and I reminded myself: Maddie wasn’t important today. James and Kerry were. Cars were beginning to pull up around us, and brightly dressed mourners walked past our cars. One man wore a Union Jack three-piece suit. He’d clearly got Kerry’s message about no black. One of our best friends was about to bury a man she’d loved for 17 years. I couldn’t even fathom how she must be feeling. Gemma nodded. “Course.” She pulled down her sun visor, got her lipstick out and applied more colour to her lips. “How do I look?” She’d told me earlier the lipstick was called Brave, which seemed apt. It popped against her soft, brown skin. Gemma had that knack of looking incredible whatever she was wearing. And today, what she was wearing was certainly a statement. A knock on the window interrupted us. It was our friend, Rob, in a sombre black suit and tie. He looked like he was going to a funeral, exactly what Kerry had instructed us not to wear. Gemma rolled down the window. I pouted. I loved Rob and his husband Jeremy, but since they’d spawned twins last year via surrogacy, it was pretty common for only one of them to turn up to occasions. However, Rob was a regular fixture in our lives, as he ran the bakery opposite our cake school in Bristol. We were business neighbours as well as friends. “Rob!” someone yelled from across the car park. He looked up and waved as a woman I was struggling to place walked up and gave him a hug. This was the first funeral I’d ever been to, and it was already striking me that it was like any big life occasion, only without the guest of honour. I glanced at Gemma. “Shall we?” I opened the door and just as my brogues hit the tarmac, a brand-new red Mini pulled up beside us. It had tinted windows and those go-faster hub caps. Total boy racer territory. Whoever was driving this car clearly wanted the world to know who they were. The Mini’s engine shut off as I slammed the passenger door of Gemma’s silver Ford Focus. I reached my arms above my head and performed a full-body stretch. It had only been a 20-minute journey to the crematorium, but I was already sticky from the heat. I was glad I’d opted for pale blue trousers paired with a short-sleeved printed shirt and no jacket. I threw a smile across the top of the car to Gemma and Rob, but they were both looking at me with panic etched on their faces. What was going on? A car door slammed behind me, and my two friends froze. Suddenly, I knew who that Mini belonged to, who it was who wanted to get noticed. Who it was standing behind me, causing my friends to turn into ice statues even on a blazing hot day like this. I closed my eyes, my heart slamming into my ribs, all the hairs on my neck standing up one by one, craning their necks to get a better look. The number of times I’d thought about this moment over the years, and now it was about to happen. I clenched my fists at my sides, the itch of anxiety burning my throat. I took a deep breath and spun round. And there was Maddie. The ex that counted. Still tall and slim. Still beautiful. Still with the most styled, thick eyebrows I’d ever encountered. And how were her blonde waves still so goddamn shiny and perfect? Just like that, and exactly as Gemma had predicted, I was 24 again. Lost, abandoned, heart-broken. Only now, coming over my emotional hill at speed were the dual cavalries of anger and rage. I’d wondered how I was going to react, and now I was getting my answer. Yep, I was completely over it. Maddie was dressed in fitted black trousers, black shirt and black lace-ups. She hadn’t got the memo about no black. I was inordinately pleased. It showed that, even if she tried to wheedle her way back in, she wasn’t part of the gang anymore. That was important. She’d lost the right a long time ago. Maddie Kind. Once the author of my dreams, then the author of my nightmares. I couldn’t say the same. All I Want For Christmas: First Chapter Preview! Hummm, it has picked my intellectual curiosity. It is going to be great. Thank you for letting me peek. Looking forward to reading the latest. Wanting to see how Justine survives this Maddie encounter. Ooooh. A perfect first chapter. Scene set, turmoil ahead and witty lines! Can’t wait to get the rest!! I’m sold! Thanks for the preview. 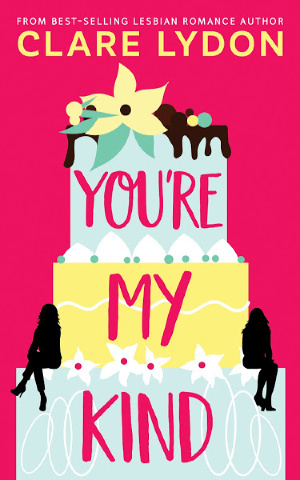 Previous Previous post: You’re My Kind: Cover Reveal!